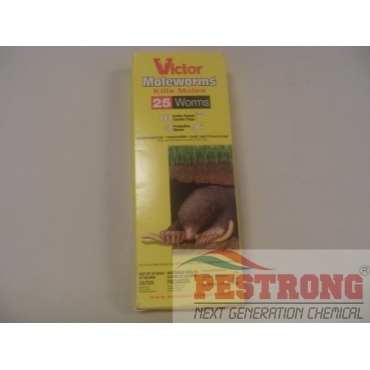 Where to Buy Victor Moleworms, Victor Moleworms Kills Moles - 25 Worms - $39.55 for Sale with Fast Free Shipping! Victor Moleworms Kills Moles - 25 Worms quickly eliminates mole problems plus provides the best value in the market. Victor Moleworms are ready to use and look and feel just like real earthworms, the moles natural and preferred food source. Moleworms are uniquely formulated to be highly attractive to moles and contains the active ingredient Bromethalin. Simply identify the active mole tunnels and treat them by placing Moleworms in the tunnel for the mole to consume and die. Victor Moleworms provide a much greater value than similar competitive mole products by giving you 25 Moleworms instead of 20 worms talpirid. Also included are 10 active tunnel locator flags and 3 protective gloves, neither of which the competition provides. I had mole ruining my yard, and I was stressed out every time I look at those molehills everywhere in it. At first I didn't want to kill them, I just wanted them to stop messing up my yard so I called a guy to have it removed from here, and the guy set up the trap, caught it and took it and I thought that would be good enough, but it came back, I don't know if it is the same one, but I still had the same problem, so this time I got this bait and dropped it inside of the holes and for 2 weeks now I haven't had anything mess up my lawn, I finally have peace in my mind.